I admit I'd never heard of this title before. I'm not an actor like my husband or my friend, V. They've heard it used many times for auditions and readings. 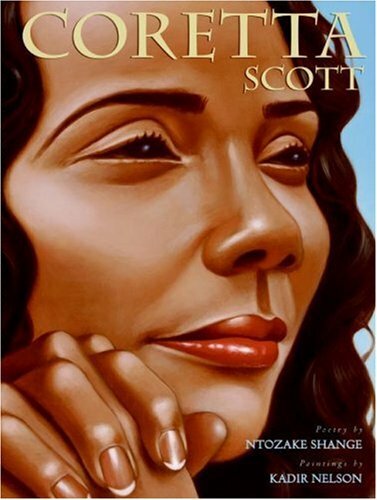 I'm happy to say I did recognize the author's name though as it is attached to a beautiful Coretta Scott King book and Ellington was not a street-both illustrated by my favorite, Kadir Nelson. It was a joy to read this choreopoem. It was encouraged in the prologue to read it outloud, so I did. The words and rhythm flowed sometimes smoothly and others rougher, jagged but still good. It helped to make a audiovision of friends who might talk this way on occasion. It worked. It has a powerful message for all people, especially women, but not just black women. And it isn't anti-men although it surely doesn't sugar coat in anyway possible. While researching the author I found this excellent interview about her life, her new-ish work, Some Sing, Some Cry, a collaborative novel she wrote with her sister and the Tyler Perry movie about For Colored Girls Who Have Considered Suicide. I plan to watch this movie, even though it didn't get great reviews, because I like the cast and I would love to hear the language. I have to wait to watch the movie until I see the play and lucky for me, I will have the thrilling opportunity in mid-March, when my family heads to Little Rock to visit V and her family. She is directing and acting in a local production and I'm so EXCITED to see it. I was inspired to read the book because she was involved and I only found out later that I would be able to watch a rehearsal of the play. Yeah... [me, jumping up and down]!!! This is an author worth checking out.